Another week, another edition of the Ligue 1 roundup. 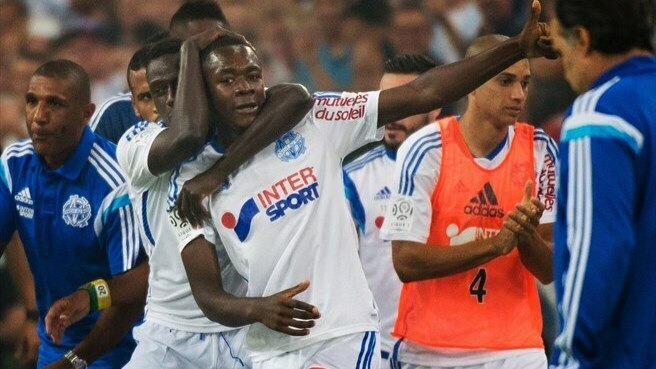 We’re eight games into the 2014-15 Ligue 1 season and Olympic Marseille are still atop the French first division following a 2-1 victory over Saint Etienne. In comparison to the demolitions they’ve produced in their last five games, this was a much more tense affair, an indicator of the jump of quality facing Saint Etienne presents. Marseille were as effervescent as ever for the first 45-50 minutes of the matchup before Saint Etienne weathered the storm and had their chance on the counter. A 2-1 victory (their sixth straight victory) for Marseille is the closest margin of victory for Biesla’s side since their 1-0 victory versus Guingamp. PSG now face Barcelona on Tuesday and have a meeting with Monaco this Sunday. The rumblings of Laurent Blanc’s job security won’t go away anytime soon, and by this time next week, he may no longer be the manager of PSG. -Lille defeated Bastia 1-0 off of a left footed strike from Divock Origi. Lille have only conceded two goals in eight games, which has hidden the fact that they’ve been very frustrating to watch going forward. Origi’s three goals this season have accounted for 43% of their goals, and have generally looked constipated going forward. Add to this Marcus Lopes’ hamstring injury and the lack of #10’s that can be put in place of him, and Lille OSC fans might have reasons to start worrying even with them currently second in Ligue 1. Lille play Wolfsburg in the Europa League this week and face Lyon on Sunday, a true test of how they’ll deal with the injuries to Lopes, Nolan Roux, Rio Mavuba and Marvin Martin. -Nantes and Lyon played to a 1-1 draw that was a cagey affair that sprang to life following a penalty decision against Lyon CB Bakary Kone. His header in the 51st minute off of a dead ball cross from Alexander Lacazette gave Lyon a 1-0 lead before Georges-Kévin Nkoudou Mbida’s dashing run on the left hand side forced Kone to commit a foul in the box that led to Jordan Veretout’s penalty being converted. The last 10-15 minutes of the match was when the game had its best moments, with a lack of quality at the final third preventing the two teams from converting their counter attacks into goals. Lyon looked much more dull in comparison to their 4-0 victory versus Lorient (who have not been the same since Vincent Aboubakar’s departure to Porto) and even the additions of Clinton N’Jie and Yohan Gourcuff didn’t have the same effects it did versus PSG. Next week there are two marquee fixtures to look forward to (unless you want to argue that Saint Etienne versus Bordeaux counts as one), both occurring on Sunday with Lyon’s matchup versus Lille and PSG versus Monaco. Monaco are still having their fair share of problems, perhaps best symbolized with their 1-0 defeat to Nice this weekend while PSG are having injuries to deal with and are playing Barcelona midweek. Meanwhile Lille will have to play Wolfsburg in the Europa league on Thursday and play Lyon (who themselves still have their fair share of injuries) on very little rest on Sunday. Lyon’s performances have been very up and down, so we’ll see which version of Lyon will turn up in the Stade Gerland.